Estimation of root-mediated carbon fluxes in forested peatlands is needed for understanding ecosystem functioning and supporting greenhouse gas inventories. Here, we aim to determine the optimal methodology for utilizing ingrowth cores in estimating annual fine-root production (FRP) and its vertical distribution in trees, shrubs and herbs. We used 3-year data obtained with modified ingrowth core method and tested two calculation methods: ‘ingrowth-dividing’ and ‘ingrowth-subtracting’. The ingrowth-dividing method combined with a 2-year incubation of ingrowth cores can be used for the ‘best estimate’ of FRP. The FRP in the nutrient-rich fen forest (561 g m−2) was more than twice that in the nutrient-poor bog forest (244 g m−2). Most FRP occurred in the top 20-cm layer (76–82 %). Tree FRP accounted for 71 % of total FRP in the bog and 94 % in the fen forests, respectively, following the above-ground vegetation patterns; however, in fen forest the proportions of spruce and birch in FRP were higher than their proportions in stand basal area. Our methodology may be used to study peatland FRP patterns more widely and will reduce the volume of labour-intensive work, but will benefit from verification with other methods, as is the case in all in situ FRP studies. Responsible Editor: Alexia Stokes . The online version of this article (doi: 10.1007/s11104-016-3070-3) contains supplementary material, which is available to authorized users. Fine roots are inherently important belowground components and mediate significant carbon (C) fluxes in many ecosystem types. Globally, fine-root production (FRP) accounts for up to 76 % of the C cycled annually through forest ecosystems (Vogt et al. 1996; Gower et al. 1996; Jackson et al. 1997). In boreal forests, on average FRP accounts for 73 % of the total root production and 32 % of the total forest production (Marschner and Rengel 2007). Fine roots also mediate C accumulation as peat in many types of peatlands (Sjörs 1991; Saarinen 1996; Laiho et al. 2003). Generally, however, we know little of fine-root-mediated C fluxes in peatlands, the C hotspots of the planet, even though there is indication that they may play a significant role in the C budget (e.g. Murphy and Moore 2010), also following land-use change (Finér and Laine 1998; Ojanen et al. 2014). Accurate estimation of C fluxes in peatlands under land use, e.g. forestry, is especially needed for developing reliable C budgets to support greenhouse gas inventories (Ojanen et al. 2014). Estimates of FRP are especially needed for this purpose. The FRP rate is dependent on several factors, such as plant species, root biomass, mean annual soil temperature and annual precipitation (e.g. review by Yuan and Chen 2010 and Finér et al. 2011). The soil nutrient regime also influences both fine-root biomass (FRB) and FRP; however, the directions of the responses have varied among studies in different ecosystems (Santantonio et al. 1977; Keyes and Grier 1981; Leibundgut 1981; Hendricks et al. 2006), and the measures of soil nutrients reported in individual studies have not allowed for a systematic synthesis (Finér et al. 2011). Yet, in the Boreal Zone, most results suggest higher FRB or FRP at poorer sites (Helmisaari et al. 2007; Yuan and Chen 2010; Lehtonen et al. 2016). For peatlands, the scarce observations so far available suggest a contrasting pattern (Finér and Laine 1998, 2000; Laiho et al. 2014). The nutrient regime of peat soils fundamentally differs from that of mineral soils: peat soils contain clearly more nitrogen (N) but fewer mineral nutrients (e.g, Table 6 in Westman and Laiho 2003). Thus, especially at the most N-rich sites, the availability of N should be favourable but high FRP may be needed to scavenge mineral nutrients. In addition to the nutrient regime, the moisture and oxygen (O) contents as well as the physical properties of peat generally differ from those in mineral soil. Consequently, patterns of FRP differing from those in mineral soils may be expected as well. Irrespective of the studied ecosystems, most of the FRP data are concerned with total fine roots without distinguishing between the understorey vegetation roots and roots of different tree species (Finér et al. 2011). This is mainly due to difficulties in identifying fine roots by species or functional groups from soil samples: it is arduous and time-consuming. Yet, the FRB of the understorey vegetation accounts for one third of the total FRB in boreal forests (Finér et al. 2011). In northern Finland, understorey fine roots and rhizomes (< 2 mm diameter) accounted for up to 50 % of the stand total FRB (Helmisaari et al. 2007). In boreal peatland forests of varying nutrient status, the FRP of field-layer vegetation varied from 24 % to 71 % of the total FRP (Finér and Laine 1998). Regarding the various species or functional groups, some studies have been done in boreal forests. For example, at boreal mineral soil sites Helmisaari et al. (2007) studied the FRB of all major tree species (pine, spruce, birch) and understorey functional groups (shrubs, grasses and herbs) in relation to site and stand characteristics. Kalliokoski et al. (2010) reported the belowground interactions in mixed boreal stands of silver birch Betula pendula Roth, Norway spruce Picea abies (L.) H. Karst. and Scots pine Pinus sylvestris L. at different developmental stages and soil fertilities in Finland. In boreal peatlands, different coexisting species may have varying rooting patterns and rooting depths (Metsävainio 1931; Ruseckas 2000). To our knowledge, such interactions among the FRPs of species in peatlands at contrasting sites are still unexplored. Several methods are available for determining FRP, and no method is ideal for all sites or study purposes (Vogt et al. 1998; Milchunas 2009). Ingrowth cores are root-free soil columns of defined volume, surrounded by a mesh, allowing roots to grow into them over a period of time (e.g. Vogt and Persson 1991; Makkonen and Helmisaari 1999; Ostonen et al. 2005; Brunner et al. 2013). Recently, we designed a modified ingrowth core method for estimating the FRP in peat soils and presented the first-year results for different sites (Laiho et al. 2014). However, first-year ingrowth data mainly capture the production of new roots for colonizing the cores and thus reflect the regenerative potential of the root system rather than the actual annual root production, especially in cold climates with prominent annual growth cycles (Cudlín and Chmelíková 1999; Finér and Laine 2000). Other components of the production of perennial root systems, such as branching and radial growth, emerge only after colonization. Here, we present 3-year data obtained with the modified ingrowth core method aiming to 1) compare ways for calculating the FRP from multi-year ingrowth biomass data, 2) determine the optimal incubation time for the ingrowth cores in peatland forests when estimating the annual FRP, 3) estimate the annual FRP and 4) determine the vertical distribution of FRP for different tree species (Scots pine, Norway spruce and downy birch Betula pubescnes Ehrh. ), shrubs and herbs in two contrasting peatland forests: nutrient-rich fen forest and nutrient-poor bog forest. We hypothesized that 1) nutrient-rich forests would show higher FRP, due to the greater species richness, higher above-ground biomass and N:mineral-nutrient ratios than in nutrient-poor forests. Based on previous studies of root systems (Metsävainio 1931; Ruseckas 2000) we also expected that 2) the FRP of various species and functional groups would show different depth distributions. The study was carried out at two typical forestry-drained peatland forest sites of varying nutrient status in southern Finland. The Kalevansuo site (60°39’N, 24°22’E) in Loppi represented nutrient-poor conditions, while Lettosuo (60°39’N, 23°57’E) in Tammela was representative of more nutrient-rich conditions. Kalevansuo was drained in 1971 and Lettosuo in 1969 and both sites were also fertilized with a phosphorus-potassium (PK) fertilizer soon after drainage. At the Kalevansuo site, the ecosystem CO2 balance has been estimated with the eddy covariance method (Lohila et al. 2011), and similar measurements have been carried out at Lettosuo since 2009. Moreover, several components of the C cycle have also been quantified in Kalevansuo (Badorek et al. 2011; Ojanen et al. 2013) as well as in Lettosuo (Koskinen et al. 2014). The nutrient-poor site was originally an ombrotrophic bog characterized by dwarf-shrubs and Scots pine and classified as a dwarf-shrub pine bog (Laine and Vasander 1996). The bog was drained with open ditches about 1 m deep and at approximately 40-m intervals. Henceforward, we shall call it a ‘drained bog forest’. At the time of this study, the site supported a tree stand dominated by Scots pine with a scattered understorey of downy birch and Norway spruce (Lohila et al. 2011). The understorey mainly consisted of forest and mire dwarf shrubs (bilberry Vaccinium myrtillus L., cowberry V. vitis-idaea L., bog bilberry V. uliginosum L., Labrador-tea Ledum palustre L.), mixed with some hare’s tail cottongrass (Eriophorum vaginatum L.) and cloudberry (Rubus chamaemorus L.). The bottom layer was dominated by forest and bog- mosses such as red-stemmed feather-moss Pleurozium schreberi (Brid) Mitt., rugose fork-moss Dicranum polysetum Sw., fine bog-moss Sphagnum angustifolium (C.E.O. Jensen ex Russow) C.E.O. Jensen and Russow’s bog-moss S. russowii Warnst. The nutrient-rich site, Lettosuo, is located about 22 km west of the nutrient-poor site, Kalevansuo. The site was originally a mesotrophic fen classified as an herb-rich tall sedge birch-pine fen (Laine and Vasander 1996), and we shall call it a ‘drained fen forest’. The fen site was also drained with open ditches of about 40-m spacing. The stand mainly consisted of Scots pine with some co-dominant downy birch and Norway spruce that formed a vigorous understorey. The understorey was more diverse but less dense than in Kalevansuo. In addition to species found in Kalevansuo, several herbs grew in Lettosuo, such as narrow buckler-fern Dryopteris carthusiana (Vill.) H.P. Fuchs and chickweed-wintergreen Trientalis europaea L. The details of both study sites in terms of soil bulk density, nutrient concentrations and stand basal area for the tree species are mentioned in Table 1. The ingrowth cores were prepared and installed as described by Laiho et al. (2014). The cores were made of polyester fabric with mesh size approximately 1-mm × 1-mm. The initial diameter of the filled cores was 3.2 cm. The effective length of the core was 50 cm with an additional tail that remained unfilled and above ground, to facilitate locating the cores after incubation. Two types of peat substrate were chosen to mimic the soil quality of the recipient site as closely as possible. For the drained bog forest, where the peat was mostly of bog-moss (Sphagnum L.) origin, non-fertilized horticultural Sphagnum peat was used. The drained fen forest was characterized by sedge (Carex L.) peat, and thus sedge peat harvested for energy use was used for that site. The bulk density of peat in both sites was checked and the filling was planned to mimic that in 10-cm sections. For the bog forest this was quite successful, while for the fen forest the bulk density was somewhat higher in the cores than in the site (Laiho et al. 2014). In all, 60 ingrowth cores were installed at each site in two different transects, 30 cores in each transect, in groups of three at 10 different points along the transects. Each transect stretched across a strip between two ditches. The first and last group were installed several metres away from the ditch margins to avoid the uneven ditch banks and the rest at about 4-m intervals. In the drained bog forest, the cores were installed in late October 2009 and in the drained fen forest in early May 2010, just before the growing season, because early soil frost prevented installation during the preceding autumn. The first set of cores was recovered after one growing season in November 2010, followed by the second and third recoveries in November 2011 and 2012, respectively. Each year, a single core was recovered from each of the 10 groups along each transect, resulting in 20 cores per site per year. During removal of the cores, a long sharp knife was used to gently cut around the cores to detach any aboveground plant parts attached to or growing through the cores and to cut the root systems, to avoid pulling out roots from the cores. The location of the soil surface at the time of recovery was marked in the cores, when different from the time of installation. After removal, the cores were cut into five segments, based on the marks (10-cm intervals) made in each core at preparation, wrapped in plastic foil with their incubation location marked and frozen (−20 °C) until further treatment. In the laboratory, the ingrowth cores were taken from the freezer and placed in a refrigerator overnight to defrost. One to two cores were defrosted at a time to avoid decomposition after defrosting. Any above-ground biomass that was attached to the cores was removed. The diameter of each segment was measured from both ends, and the actual segment length was recorded (Table S1 in Supplementary material). All the roots found outward of a core segment were cut along the fabric surface, and the roots inside the core were separated, using a pair of tweezers, washed to remove any peat remains and collected in a Petri dish. The peat of each segment was also collected for determination of bulk density. Living fine roots were separated and sorted from the second- and third-year cores by tree species and understorey functional groups, while first-year fine roots were separated as total roots. Some dead roots were found in the second-year cores and were pooled as ‘total dead roots’. As we assumed and observed, there were more dead roots in the third-year cores; they were sorted by species and functional groups. In the fen forest, three third-year cores out of 20 were not separated by tree species and understorey functional groups, but rather pooled as total roots. Furthermore, all the roots were sorted into three diameter classes: ≤ 1 mm, 1–3 mm and 3–5 mm, since these were the most commonly used diameter classes (Finér et al. 2011). The roots were kept at room temperature for about 24 h to evaporate the water, then oven-dried to constant mass at 30 °C and weighed to 1-mg precision. In most cases, the length of the topmost segment was less than 10 cm after recovery (Table S1 in Supplementary material), either due to a change in the soil surface, which may be quite dynamic in peatlands, or peat shrinkage or both. The mean lengths (± standard deviations) of the top 0–10-cm layer after recovery, in the bog forest were 8.1(± 0.7), 7.9 (± 0.7) and 6.9 (± 0.8) cm for the first, second and third year, respectively, and the corresponding values for the fen forest were 9.4 (± 1.1), 9.6 (± 0.4) and 9.1 (± 1.2) cm, respectively. The actual lengths of the subsequent layers were generally closer to the original length (10 cm) in both the bog and fen forests. Based on this we corrected the biomass values for those topmost segments in which the majority of the roots occurred, to avoid underestimation of biomass (n = 60 of 60 for Kalevansuo and 47 of 60 for Lettosuo). This was done by calculating the biomass per centimetre of segment and multiplying the value by 10 cm. This correction effect for the 0–10-cm layer increased the total FRP by 7 % for the first year, 11 % for the second year and 13 % for the third year in the drained bog forest. The corresponding figures for the drained fen forest were 8 %, 3 % and 10 %, respectively. The comparative identification of tree species and understorey functional groups was done in four steps. First, we distinguished and separated the roots of trees (Scots pine, Norway spruce and downy birch), primarily based on the roots having ectomycorrhizal tips, unlike the understorey species that host ericoid mycorrhizae (invisible) (Tables 2 and 3). Second, we identified the Scots pine roots, primarily by their easily identified dichotomously branched mycorrhizae, and colour: Scots pine was lighter in colour than Norway spruce. Next, we separated the roots of Norway spruce and downy birch by comparing their root and tip morphology, as shown in Table 2. Finally, the herb roots, including graminoids and forbs, were separated from shrubs mainly by their yellowish, curly and long fine-root structure (Table 2). These criteria were developed before root sorting, using samples of known species from the study sites and based on previous work by our team (Helmisaari and Brunner 2006; Helmisaari, H-S, personal communication). The dead roots were mainly separated based on colour, appearance of the phloem (outer layer of bark), elasticity of the tissue and toughness (Persson 1983; Tufekcioglu et al. 1999; Laiho and Finér 1996). These properties were checked under a stereomicroscope. When the roots were dark in colour, we scratched the exterior cortex to look for the inner colour, and the roots were considered living when the inner colour was white, yellow or grey and the tissue was elastic. In contrast, the dead roots were mostly brown, dark or black, broke easily and were in various stages of decay (Table 3). A root was considered dead when it showed the characteristics described in Table 3 along its full length. Partially dead roots were considered living. However, when possible, dead rootlets attached to the living roots were separated with scissors. During separating and washing, some parts of roots both living and dead fragmented into small pieces (fragments less than 1 mm) and could not be collected. A vegetation survey was done at each ingrowth core group (10 groups per transect, two transects per site) in early September 2014. In the drained bog forest, we used a 200-cm × 50-cm plot to cover the locations of the three ingrowth cores per group, while in the drained fen forest a 100-cm × 100-cm plot was analysed. The percentage projection coverage of the understorey plant species and moss species groups was recorded. The estimation was done on 20 plots at each site, using the coverage scale of <1, 1, 2, 5, 10, 15, 20, 30, …, 100 % for each species or species group. The fluctuations in root biomass during the growing seasons are caused by several factors, including soil temperature (Lyr and Hoffman 1967; Kramer and Kozlowski 1979) and the depth of the water table (WT) level (Heikurainen 1955). To evaluate the FRP patterns in relation to the soil temperature profile and WT level, we measured both at the sites. The WT level was measured, using a TruTrack Data Logger (http://www.trutrack.com/wt-hr.php). The soil temperatures at depths of 5, 10, 20 and 30 cm were measured with Pt-100 temperature probes connected to a Nokeval 680 logger (Nokeval Oy, Nokia, Finland) and recorded in a desktop computer running a Python script. The WT level during the growing seasons (May–November) of the second-year study period was about 40 cm below the surface in the drained bog forest and 50 cm in the fen forest (Fig. 1). At both sites the soil temperatures peaked in July. The temperatures decreased from the surface to the deeper layers during May–August, were similar in September and inversed in October–November (Fig. 1). Due to the dynamics, the mean soil temperatures during the root-growing season were rather similar in all the layers and at both sites. The mean temperatures at 5, 10, 20 and 30 cm below the surface were 10.9, 10.3, 10.2 and 9.7 °C, respectively, in the drained bog forest and in the drained fen forest 10.2, 9.7, 9.3 and 8.8 °C, respectively. Conventionally, when ingrowth cores with short incubation times (1 or < 2 yr. ) are used, FRP is estimated as the mass of the fine roots extracted from the ingrowth core (Idol et al. 2000; Valverde-Barrantes et al. 2007; Aragão et al. 2009; Brassard et al. 2011; Laiho et al. 2014). But using such short incubation times (< 2 yr) may result in underestimation (Steele et al. 1997; Vogt et al. 1998; Finér and Laine 2000). Therefore, to obtain a steady-state FRP (Steele et al. 1997; Finér and Laine 2000; Lukac and Godbold 2001), multiyear biomass data are needed, which is more complicated because in fine-root dynamics, the roots grow and die continuously during the growing seasons. Previously, FRP based on multiple periods/years of ingrowth biomass data has been estimated by either 1) dividing the fine root biomass by the incubation time (Yuan and Chen 2012) or 2) subtracting the fine root biomass of consecutive incubation times (Finér and Laine 2000). Here, we report the results of both methods and refer to them as 1) ingrowth-dividing (ID) and 2) ingrowth-subtracting (IS) methods. The latter method resembles the decision-matrix method by Fairley and Alexander (1985), where they reported to estimate FRP by the difference in biomass of the incubation times. So far, there are no studies available in which the results of the two FRP estimation methods, ID and IS methods, have been compared, using several years of data from different sites. We used the total root masses (including living and dead roots) in both the ID and IS methods. Since some of the dead roots were probably decomposed (i.e. had lost some mass) and some could probably no longer be identified, the root production could have been underestimated. Thus, we added 30 % mass to the dead root mass, which is the first-year mass loss rate studied for a range of peatland species in southern Finland (Straková et al. 2012). Based on the dead fine-root values observed (presented in the Results section), we assumed that most dead roots observed had been dead and decomposing for a maximum of 1 year. To support the methodological work, we first used repeated measures analysis of variance to evaluate the differences in total FRB and total dead-root mass observed in the in-growth cores between the two sites, two transects of each site and the three incubation times. We considered the transect and site as between-subject (grouping) factors and incubation time (years) as the within-subject (repeated) factor. Next, the differences in yearly FRP estimated by ID and IS methods based on different incubation times were tested using a simple t-test. Here, we sought to determine, which method and which incubation time can be considered to result in the ‘best estimate’ to describe FRP. This estimate should be as robust and resource-efficient as possible, that is, it should fluctuate as little as possible over the years, and utilize as short an incubation time as possible. When the ‘best estimates’ of FRP were chosen, we also used the repeated measures analysis of variance for evaluating the FRP patterns, considering site and transect as grouping factors and depth as the repeated factor. At this stage, the length of the incubation time needed not to be considered, since it was fixed when choosing the ‘best estimates’. During analysis, we found considerable departure from sphericity in all cases (variances differed among depths). Therefore, we applied the Greenhouse-Geisser correction value in the interpretation of the F-ratios, because the estimate of sphericity (epsilon value) was always smaller than 0.75. All these analyses were done, using IBM SPSS statistics 22 (IBM Corp., Armonk, NY, USA). The relationship between FRP and understorey vegetation composition was evaluated, using principal component analysis (PCA) in Canoco 5. The ordination was based on the project cover of the understorey vegetation species and moss groups (Sphagnum mosses versus forest mosses including Pleurozium schreberi, glittering wood-moss Hylocomium splendens (Hedw.) Schimp. and Dicranum polysetum) recorded for each ingrowth core group. The correlations between the plant community composition, as described by principal components 1 and 2, and the FRP best estimates for each tree species and understorey functional group were estimated and projected on the ordination space as supplementary variables. The total FRB observed in the cores increased significantly with incubation time (1–3 yr) at both sites, as did the dead-root mass from year 2 to year 3 (Tables 4 and 5). The drained fen forest showed each year significantly larger biomass and dead-root mass than did the drained bog forest (Tables 4 and 5). The dead roots in the second year accounted for only 2 % of the total root mass at both sites. The proportion of dead roots in the third year increased to 7 % in the drained bog forest and 11 % in the drained fen forest. Both the FRB and dead-root mass decreased from the topmost 0–10-cm down to the 40–50-cm layers at both sites (Table 5). The FRP estimated by the ID method showed similar values for the second and third years at both sites. The estimates were 244 and 224 g m−2 for the second and third years in the drained bog forest, and 561 and 552 g m−2 in the drained fen forest, respectively. In contrast, the IS method resulted in different values for the second and third years (Fig. 2a, p < 0.001). The IS method estimates showed overall maximum values for the second year and minimum values for the third year, i.e. 370 and 184 g m−2 in the drained bog forest and 906 and 535 g m−2 in the drained fen forest, respectively. The second-year estimation by IS method was clearly higher, due to the low biomass growth during the first year, whereas that of the third-year estimation was similar to the estimates of the ID method. To summarize, the ID method resulted in more robust estimates and consequently, we considered that it should be utilized for the ‘best estimates’ of FRP. Since the second- and third-year ID estimates were similar, we considered that two-year incubation time is sufficient and may be used for the ‘best estimates’ in future studies to save time. Consequently, we henceforward examine the patterns in FRP using ID estimates based on two-year data as the ‘best estimates’. The best estimate for FRP in the fen forest, 561 g m−2, was more than twice that in the bog forest, 244 g m−2, and the difference between the sites was significant (Table 6). Both bog and fen forests showed significant differences in the FRP allocation by depth (Table 6, Fig. 3). Most of the root production occurred in the upper 0–20-cm layer: 82 % and 76 % of the total root production at the bog and fen sites respectively. The depth and site interaction was also significant, indicating differing FRP depth profiles for the sites (Table 6, Fig. 3). Most of the FRP (92 %) was found in the ≤1-mm diameter class at both sites (Table 7). However, in the drained fen forest the shrub groups showed relatively more FRP in the 1–3-mm diameter class, accounting for 25 % of the total FRP. We observed negligible amounts of FRP in the 3–5-mm diameter class (< 1 % of the total FRP) and included this in the 1–3-mm diameter class. No systematic patterns of FRP were found in relation to distance from the ditch in either the drained fen or drained bog forest. Although the total annual FRP was higher in the drained fen forest than the bog forest, the species-level FRP showed differences related to species composition (Fig. 3). The FRP of Scots pine and herbs did not differ between the sites. The FRPs of shrubs were greater in the bog forest than in the fen forest (Table 6, Fig. 3), while the FRPs of Norway spruce and downy birch were higher in the fen than in the bog forests. 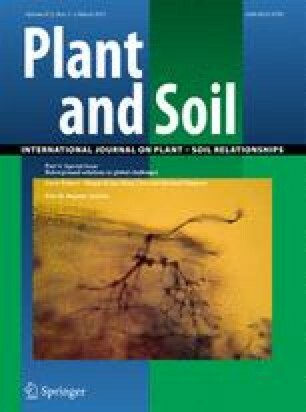 The FRPs of Scots pine, Norway spruce and the shrub functional groups differed significantly among the soil layers at both sites. Of all the species, only Norway spruce showed different depth profiles for the two sites (Table 6, depth-site interaction, p < 0.001). Downy birch demonstrated no significant differences in the FRP allocation by depth at either site, indicating constant FRP along the soil profile (0–50-cm layers). All of the herb FRP in the drained fen forest and 60 % in the drained bog forest was concentrated at depths of 20–50-cm, which also indicated deeper rooting patterns for this group. Trees, after pooling all species, accounted for most of the FRP at both sites: 71 % of the total FRP in the drained bog forest and 94 % in the drained fen forest. The remaining FRP was accounted for by shrubs: 29 % in the bog forest and 6 % in the fen forest. The FRP of herbs was insignificant compared with that of the arboreal species. The forest floor in the drained bog forest was mostly covered with forest mosses (90 % projection cover). In contrast, in the drained fen forest the total moss cover was 50 %: 30 % were forest mosses and 20 % were bog-mosses of the genus Sphagnum. Shrubs were more abundant in the bog forest than the fen forest. In the bog forest, Ledum palustre showed the highest coverage, followed by Vaccinium uliginosum (Table 8). Grasses and forbs were negligible in the bog forest but were present in the fen forest. PCA of the understorey vegetation cover also captured the general difference between the bog forest and the fen forest (site centroids on the opposing sides of the origin; Fig. 4a). However, the ingrowth core locations showed a vegetation continuum, with some locations in the fen forest resembling closely those of the bog forest (Fig. 4b). The strongest gradient in the understorey vegetation (PC1) was characterized by ample forest moss cover at one end (left of origin in Fig. 4) and Sphagnum cover at the other end (right of origin). There was a secondary gradient (PC2) from a moss-free surface with little understorey vegetation, which was more typical of the fen forest (below the origin), towards surfaces with high moss or shrub cover (above the origin). The FRP of the tree species and understorey functional groups showed logical patterns relative to the above-ground patterns, while the FRP of shrubs increased with increasing shrub cover and that of herbs with the cover of the herbaceous species (Fig. 4a). The FRP of spruce and birch was highest at locations with little or no forest moss or shrub cover, which is typical of the fen forest, while the FRP of pine was highest at locations with forest mosses and shrubs. To our knowledge, this study is the first to compare FRP estimation between two calculation methods that we refer to as ID and IS, using 3-year ingrowth-core biomass data from peatland forests. We recommend further use of the ID method coupled with 2-year incubation of ingrowth cores in future studies. Since the total FRP estimates from the second and third year ID method and the third year IS methods were similar at both sites, adding a third year did not seem worthwhile, even though in principle the root systems inside the cores are more mature and thus ‘natural’ with each year added. When the FRP was estimated for the various tree species and understorey functional groups, both the ID and IS methods showed similar results. The inconsistency in the herb FRP between years most likely reflected the high random error in the minuscule biomasses observed at both study sites. However, this does not imply that further methodological studies would be futile. Consistency and robustness are necessary prerequisites for any good method, but they alone are no guarantee of accuracy. The consistency of the estimates was in practice caused by highly dynamic root biomass increment in the cores – small in first year, greatly increasing in second year, and moderately decreasing in third year. These dynamics and the high third year FRBs clearly indicate that root growth in the cores is not identical to root growth in undisturbed soil. The first-year FRBs were clearly underestimates, because it required time for the roots to colonize new spaces in the soil (e.g. Finér and Laine 2000; Hertel and Leuschner 2002). During the second year, the root biomass increment, with threefold increase in the bog forest and fourfold in the fen forest, showed maximum growth potential, while during the third year the available resources in the cores already became limited, as indicated by the reduction of biomass increment. Overall, the present study resulted in an FRB in the 0–20-cm layer similar to that of a previous independent estimate for the bog forest (419–446 g m−2, Table 9, versus 416 g m−2 of roots less than 2 mm in diameter, Ojanen et al. 2013), but in a clearly higher FRB for the fen forest (1008–1177 g m−2 versus 351 g m−2, Ojanen et al. 2014). This suggests that our FRP estimate was also realistic for the bog forest, but an overestimate for the fen forest; however, we have no ‘true’ FRP to verify this. The root biomass samples of Ojanen et al. (2013 and 2014) additionally included 763 and 1318 g m−2 of thicker roots (diameter 2 mm – approximately 50 mm; upper diameter not reported) in the bog and fen forests, respectively. The presence of such root systems affects the environment for FRP in reality. Earlier studies on mineral-soil sites have indicated that ingrowth-core methods mostly yield underestimates of FRP as compared to other methods including minirhizotrons (Tierney and Fahey 2001; Hendricks et al. 2006; Milchunas 2009); however, in some cases similar or overestimates have also been reported (Milchunas 2009). Underestimation may have been caused by the relatively large size of the ingrowth area (Milchunas 2009), a factor that we have remedied by the use of small-size cores. Another reason for underestimation may be grazing and/or decomposition losses during incubation (e.g. Fahey and Hughes 1994). Factors potentially causing overestimation include root proliferation by severing – even though in some cases also reduction in root growth following severing has been observed – that should not be the case with our method that has been designed to minimize this disturbance, and root proliferation in the root-free, i.e. competition-free soil in the cores (Milchunas 2009). The latter we cannot avoid when applying ingrowth cores; however, this phenomenon should be decreasing with the increasing FRB in the cores over time. Thus, we do not perceive factors unambiguously leading to our best estimate FRP being either under- or overestimate. In any case, it is an underestimation of fine-root related belowground C allocation, since it does not include exudation or sloughing. The accuracy, or rather the level, of our FRP estimates may be assessed by comparing them to results obtained with minirhizotrons installed at the same study sites, but several years of monitoring are needed to obtain reliable results from this method (Strand et al. 2008). Unfortunately, root researchers have to live with the understanding that the true value of FRP may never be known (Milchunas 2009). Our study revealed higher annual FRP in the drained fen forest than in the bog forest, which supported our hypothesis. In comparison to studies in other drained bogs and fen forests, our study also showed a generally higher FRP. Finér and Laine (2000) estimated a mean FRP (diameter < 2 mm) between 60 and 225 g m−2 yr.−1 derived from a 3-year ingrowth core study. With the sequential coring method, Finér and Laine (1998) obtained estimates similar to or lower (diameter < 2 mm) than those in our bog forest, depending on their calculation method (all data versus significant differences only). These studies are the only ones to report FRP, using multiyear data in boreal peatlands. Other previous estimates were based on 1-year biomass data, e.g. 108 g m−2 yr.−1 for a naturally dry bog (Murphy and Moore 2010) and 62 g m−2 yr.−1 for a drained bog forest (Murphy et al. 2009) and, based on our results, underestimated the FRP in boreal peatlands. Most of the total FRP occurred in the top 0–20-cm of the peat soil at both sites, which is in accordance with previous observations on FRB and FRP in peatland forests (e.g. Ruseckas 2000; Murphy and Moore 2010). The higher FRP in the fen forest may have resulted from several factors. The soil nutrient status, as well as the above-ground biomass and production, were much higher in the drained fen forest, where the drainage was also better, the WT level deeper and the peat more oxic. In addition, there was a lush understorey of young fast-growing spruce that held about the same amount of leaf biomass as the dominant pines (unpublished data), even though their proportion of the stand volume was only about 12 %. This was reflected as the clear dominance of spruce in the fen FRP. However, since these are only two sites of a wide variety of drained peatland forests, a higher number and wider range of sites are needed to explore the main constraints for FRP and the C fluxes it mediates in peatland forests. With the method we developed, the prerequisites for such research have greatly improved. Our study is the first in boreal peatland forests to quantify the FRP and its depth distribution by different tree species and understorey functional groups in mixed stands. We found slightly higher Scots pine FRP in the drained bog forest (134 g m−2 yr.−1) than in the fen forest (83 g m−2 yr.−1), even though the pine basal area was the same at both sites. The bog was practically a pure pine stand, whereas the fen was a mixed stand with large pines and birches and a dense understorey of spruce, which also resulted in increased competition for resources in the fen forest. Similarly, Finér and Laine (1998, 2000) also observed higher pine FRP in a drained bog forest than in fen forests bearing similar basal areas for pine. Thus, pine in general may produce fewer fine roots in peatland forests when the soil nutrient status is better. Similar patterns have also been found for Scots pine FRP in boreal mineral-soil forests (Helmisaari et al. 2007; Kalliokoski et al. 2010). Thus, the FRP patterns of individual species may differ from the pattern in total FRP, which in our study increased with soil nutrient status. The other tree species, Norway spruce and downy birch showed significantly higher FRP in the drained fen forest than the bog forest. This reflected the stand compositions: there was very few spruce or birch in the bog forest. The understorey of Norway spruce in the drained fen forest was vigorous, which explains its extensive FRP. The FRP of both Norway spruce and downy birch in the fen forest was quite high, compared with their proportion in the stand basal area. For conifer species, there is evidence of disproportionate FRP and stand basal area (Bauhus and Messier 1999). Young, dense spruce stands may have very high FRB (Ostonen et al. 2011), which may be reflected in the FRP as well. The extensive Norway spruce FRP in the fen forest may further be explained by the strong competitive potential of this species resulting from its higher shade tolerance (Kuusela 1990). The present study demonstrated higher shrub FRP in the bog forest (68 g m−2 yr.−1) than in the fen forest (27 g m−2 yr.−1), closely following the differences in shrub cover. In contrast, Finér and Laine (2000) estimated lower shrub FRP (17 g m−2 yr.−1) in bog forests than in fen forests (67–142 g m−2 yr.−1), using ingrowth cores. Their bog forest was of the same site type i.e. dominated by dwarf shrubs, as ours, while the nutrient status of their fen forests was slightly lower than ours. However, our shrub FRP is in accordance with that of Finér and Laine (1998) field layers, estimated by the sequential coring method. This may indicate that our modified method indeed resulted in fewer disturbances and facilitated more rapid colonization of shrub fine roots than did previous ingrowth core methods. The visual identification of different tree species and functional groups is laborious and may in some cases be arbitrary when many tree roots grow in the same layer and appear similar in colour and structure. This may lead to misidentification of some roots among the various species. The separation of dead roots from peat is an even more subjective procedure. This bias or systematic error in identifying the species and functional groups could affect the specific biomass, production and turnover estimates, and these errors are of course relatively larger in species with small root biomasses. However, the PCA supported our identification, showing a logical association of the FRP of the tree species and understorey functional groups with that of the above ground cover. Fine root turnover (FRT), which describes the rate of fine-root litter input into the soil, is crucial to the belowground C budget as well as nutrient cycling. A rough estimate of FRT may be calculated by dividing the FRB by the FRP. Based on the FRP results of this study, we obtained three estimates for the FRT, based on the maximum biomass = third-year biomass (Gill and Jackson 2000), the mean biomass = mean of second- and third-year biomasses (McClaugherty et al. 1982) and the independent biomass measured by Ojanen et al. (2013 and 2014) (Table 9). In case of the mean biomass, we used the mean of only second- and third-year ingrowth biomass, because first-year FRBs were underestimates, since it required time for the roots to colonize new spaces in the soil (Finér and Laine 2000; Hertel and Leuschner 2002). For the bog forest, all the estimates agreed quite well. In contrast, for the fen forest, the FRT estimates using the maximum and mean biomasses of the ingrowth core were similar but inconsistent with the FRT of the independent biomass. This is because the independent FRB was clearly smaller than the FRB based on our ingrowth cores. However, the FRT using both the maximum and mean biomass values somehow agreed with studies of mineral soils by Hansson et al. (2013) in a mixed conifer stand and Leppälammi-Kujansuu et al. (2014) in a spruce-dominated stand. The FRT estimated, using the biomass found in the ingrowth cores, rather than using the independent FRB, may in fact be more realistic, since both the FRP and FRB in the cores represent the same fine-root system. In the surrounding soil, the FRB is constrained by the whole root system including the thicker roots, and thus it is inherently different from the FRB in the cores. Estimating the fine-root mediated C flux to the soil is clearly very sensitive to both the FRB and FRP estimates used, and we conclude that insufficient data are available for reliably estimating this flux. Overall, it seems that obtaining consistent estimates is more challenging for nutrient-rich than nutrient-poor sites. This research was funded by the Maj and Tor Nessling foundation and the Finnish Forest Research Institute (project 3609). We thank Markku Koskinen for providing the WT data, Harri Vasander for the external review, and James Thompson for language revision; all representing the University of Helsinki.